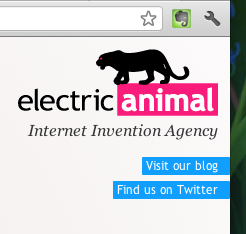 Electric Animal: We've got a new website... or at least a new home page! Woo-hoo, we've now got a home page for electricanimal.co.uk. I used impress.js to build it, and it took a grand total of 11 hours to design and build from start to finish, all beautifully time tracked in our extremely powerful time-tracking and accountancy system Freeagent. Saying it took basically a day to make is not an idle boast - I'm really impressed by how easy it is to work with CSS3 in 3D using impress.js. But also, building something that quickly is a sure fire sign that it needs more work. We've included a beta swoosh, and a page asking if there's any illustrators or designers out there who might be able to help us. There's even a somewhat hastily put together brief posted up there. If you think you can help, get in touch via Twitter. In the meantime, better live than nowhere, we figured! We'd very much welcome any comments below. Let us know what you think of the site! OK, OK, so impress.js doesn't work on IE. Add that to your pile of reasons to get Chrome.